Looking to improve your application's security? Automating vulnerability reporting helps you prevent attacks that leverage known security problems in code that you use. In this blog we'll show you how to achieve this with Oracle's Developer Cloud. Most developers rely on third party libraries when developing applications. This helps them reduce the overall development timelines by providing working code for specific needs. But are you sure that the libraries you are using are secure? Are you keeping up to date with the latest reports about security vulnerabilities that were found in those libraries? What about apps that you developed a while back and are still running but might be using older versions of libraries that don't contain the latest security fixes? DevSecOps aims to integrate security aspects into the DevOps cycle, ideally automating security checks as part of the dev to release lifecycle. The latest release of Oracle Developer Cloud Service - Oracle's cloud based DevOps and Agile team platform - includes a new capability to integrate security check into your DevOps pipelines. Relying on the public National Vulnerability Database, the new dependency vulnerability analyzer scans the libraries used in your application against the database of known issues, and flags any security risks your app might have based on this data. The current version of DevCS support this for any Maven based Java project. Leveraging the pom files as a source of truth for the list of libraries used in your code. When running the check, you can specify your level of tolerance to issues - for example defining that you are ok with low risk issues, but not with medium to high risk vulnerabilities. When a check finds issues you can fail the build pipeline, send notifications, and in addition add an issue into the issue tracking system provided for free with Developer Cloud. Check out this demo video to see the process in action. Having these type of vulnerability scans applied to your platform can save you from situation where hackers leverage publicly known issues and out of date libraries usage to break into your systems. These checks can be part of your regular build cycle, and can also be scheduled to run on a regular basis on systems that have already been deployed - to verify that we keep them up to date with the latest security checks. It was time for a technology detox. When I left work on Good Friday, I left my laptop at the office. I got home at 3PM and put my mobile phone on a charger that I wouldn't see until Monday at 9AM. And my life free of external, involuntary, technological distraction began... along with the stress of being out of touch for the next 3 days. Here's what I learned. It's really stressful at first, but you get over it. All those people you told "if it's an emergency, contact my significant other" will not have any emergencies suitable for contacting your significant other. I learned far more about myself and we'll get to that in a second. Why in the name of God? Thanks to the cruel "Screen Time" tracking feature of my Apple iPhone, I found that on the average day, I lift up my phone more than 30 times before 11AM every day and then it gets worse from there. In general, I am using my phone 6+ hours per day and many days are a lot worse. I pay more attention to my phone than the people around me: if it's always within arm's reach and I use it for everything. As a CEO, my outward reason for my phone addiction is that I have to be connected: emails and text messages must be dealt with immediately and without my calendar, I might miss a Very Important Meeting. In reality, I am completely addicted to my cell phone and the whole "I have to stay connected" thing is largely rationalization. But about a week ago, I looked around at the people in my life and realized that we're all addicted: for some of us, it's about communication. Others live in their games. Some people are on Instagram looking at puppies and kittens. Whatever your thing, you're getting it through either your phone or your laptop. So why take a break? Mostly to find out 1) if I could make it for 42 hours; and 2) what I could learn from the experience. I settled on Easter weekend (April 19-22). Texting. According the aforementioned Evil Screen Time, I knew that I spent 1.5 hours a day on text messaging. To be clear, I'm not a tween: my company uses text messaging more than any other communication vehicle, it's how I stay in contact with friends (who has time for phone calls? ), and it's about the only way my kids will talk to me. Email. While texting is great for short communications and quick back-and-forths, I get around 200 non-spam emails on the average day and about 50 on the average weekend. When you have something longer to say or it's not urgent, email is the way to go. Navigation. I have long since forgotten how to drive without the little blue dot directing me. There are about four places I felt I could find on my own (work, home, airport, grocery store), but I was sure that I would be lost without Google Maps or Waze. Games. I am level 40 on Pokemon Go (humble brag) and I have played it every day since July 2016. It's literally the only game on my phone, but I have to keep my daily streak going lest... I don't know, actually, but the stress of missing out on my 7-day rewards was seriously getting to me. Turns out, I didn't miss Pokemon Go, I'm actually a decent driver without a phone (it's like falling off a bike: you never forget how), and if you're off email, you never know what you're missing. I did miss texting, but not in the way I thought I would. So what did I actually miss? Bitmoji. I genuinely missed sending cute pictures around to my friends of me as the Easter Bunny and receiving their pictures dressed up inside Easter eggs. I kept wanting to sneak peeks at my wife's phone to see if she was getting anything cute, though I did manage to resist. Information. I had forgotten the days when questions didn't have answers. What's the address of Academy Sports? I didn't know, so I just had to drive in the general area where I thought it was. What time does Salata open? No idea, so I drove there and got to wander outside for a bit until they opened for the day (fun fact: stores still post actual opening/closing hours on their front doors!). What time is the movie Little playing at the AMC Grapevine Mills 30? Who won the Texas Rangers game (when in doubt, assume it's the team they're playing against)? Who is the actor that plays that one character in that movie, oh, come on, you know who I'm talking about, that guy, let me just look it up for you, oh, damn, I can't until Monday, FML? Calendar. I worried all weekend about my schedule for the upcoming week: when was my first appointment on Monday, what did I have scheduled for after work, was there anything I should be preparing for, when was I leaving town next, where was I supposed to be for Memorial Day weekend? It went on-and-on, and it turns out that none of it matters. Photos. I didn't realize how many photos I take of the world around me, until I couldn't take any photos at all. I had to use a long-forgotten mental trick called "memory." It made me pay a lot more attention to the world around me, and I genuinely remember more of how I experienced the weekend than if I had been trying to catalog everything through pictures. I'm sure photos would have made this blog more appealing, but I'm doing all this from memory, so all we have are words. Connection. I wanted to know what my friends and family were doing and to let them know I was thinking of them. Without technology, this is almost impossible nowadays. I had to resort to seeing them in-person: I met a couple of them at a restaurant and we got together with another friend for cycling, a movie, and Game of Thrones. But it turns out that those friends - the ones I spent time with in-person - I felt more deeply connected to than before the weekend started. Texting is about surface-level connecting, but facetime (note that this is different than FaceTime) is about bonding. What changed over the weekend?For one, I spent a lot more time outside. I played frisbee, went on a fourteen-mile bike ride, worked out at the gym, walked around some, went to the mall, saw a movie, and in general, I actually experienced more of the world than I normally do. I also didn't trip over a curb once, because unlike normal, I was looking up the whole time. I read more instead of looking at my phone each night to fall asleep. I made it 100 pages into a book that I've been meaning to read for a year now. And in the morning I didn't reach for my phone on my bedside table either. I tend to forget how immersed you can get in a book when you don't have notifications popping up constantly telling you what you should be doing instead of reading in peace. I spent a lot of time with my wife this weekend to the point that she was probably sick of me by Sunday night, but we spent real time with each other without any technological distractions. I finally gave her an Edward Break last night by heading off to take a long bath while reading more of my book (Stealing Snow, if you're curious). She fell asleep and I stayed up reading until midnight. Any lasting effects?I thought I would be longing for my phone and my laptop (particularly text and emails) at exactly 9AM this morning. I waited until 9AM and opened up my laptop to see what appointment I had at 9AM. It turns out no one needs me - or loves me? - until 10:30AM, so I opened up a browser window to write my first blog entry in many, many months. My cell phone is still face down, and as of 10AM, I still have no idea who texted or emailed me all weekend. I'm blissfully writing away, and I have to admit, I'm not looking forward to going back to my constantly-connected world. Will giving up your technology addiction for a weekend give you some sort of mystical clarity, a purity of soul that let's you know how the Dalai Lama must feel when he's between text messages? No, but it will help you find out just how addicted you are, and how strong your willpower is. It'll help you understand what you're missing when you're disconnected, and if you're like me, you'll find that in some ways, you actually like it. Now will I ever do this again? I'll let you know after I log into my email, read all my texts, and see just how bad the world got over the weekend. Until then, I'm blissfully unaware. Finally, I have reached a point that I can live with for Grid 18c upgrade because the process runs to completion without any error and intervention. Note that ACFS Volume is created in CRS DiskGroup which may not be ideal for production. Rapid Home Provisioning Server is configured and is not running. While we both encountered the same error “Upgrading RHP Repository failed”, we accomplished the same results via different course of action. So how did I get myself into this predicament? I followed blindly. I trust but did not verify. Upgrading GI 18.1 does not require upgrading MGMTDB nor does it require installing a MGMTDB if it currently does not exist. It's the user's discretion to maintain and upgrade the MGMTDB for their application needs. Note: MGMTDB is required when using Rapid Host Provisioning. The Cluster Health Monitor functionality will not work without MGMTDB configured. If you consider to install a MGMTDB later,  it is configured to use 1G of SGA and 500 MB of PGA. MGMTDB SGA will not be allocated in hugepages (this is because it's init.ora setting 'use_large_pages' is set to false. The following parameters from (Doc ID 2369422.1) were the root cause for all the issues in my test cases. Because MGMTDB is not required, it makes sense to set the following but resulted in chaos. Starting with Oracle Grid Infrastructure 18.1.0.0.0, when you install Oracle Grid Infrastructure, the Rapid Home Provisioning Server is configured, by default, in the local mode to support the local switch home capability. Here is what worked from end to end without any failure or invention. The response file was ***not*** modified for each of the test cases. Here is what the environment looks like after the 18c GI upgrade. Notice ACFS is configured for RHP. 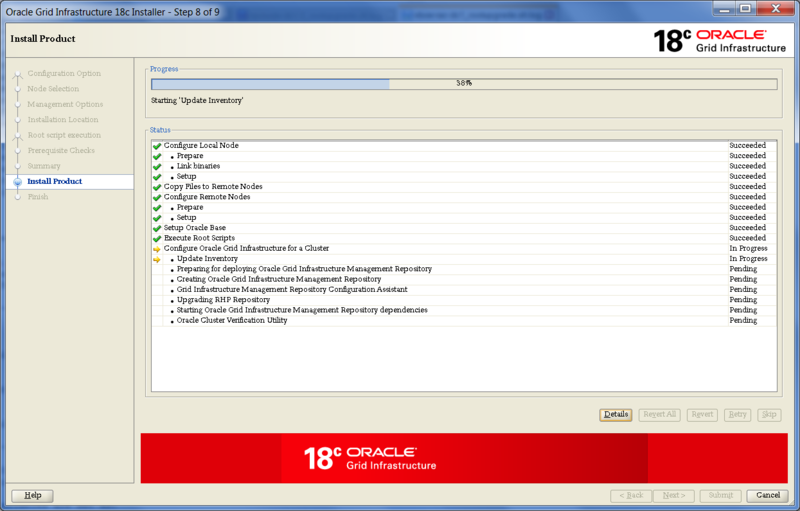 Oracle Instance alive for sid "+ASM1"
Oracle Clusterware patch level on node racnode-dc1-1 is . Oracle Clusterware release patch level is  and the complete list of patches [27908644 27923415 28090523 28090553 28090557 28256701 28435192 28547619 28822489 28864593 28864607 ] have been applied on the local node. The release patch string is [18.5.0.0.0]. Oracle Instance alive for sid "hawk1"
Let me show you how this is convoluted. In my case, it’s easy because there were only 2 actions performed. Do you know what GridSetupAction was performed based on the directory name? This is how you can find out. INFO: Setting variable 'ROOTSH_LOCATION' to '/u01/18.3.0.0/grid/root.sh'. Received the value from a code block. INFO: Setting variable 'ROOTSH_LOCATION' to '/u01/18.3.0.0/grid/rootupgrade.sh'. Received the value from a code block. It might be better to use GUI if available but be careful. For OUI installations or execution of critical scripts it is recommend to use VNC to avoid problems in case connection with the server is lost. I was using X and connection was lost during the upgrade. It was a kiss of death with this being the last screen capture. After looking for information in MOS, there wasn’t much that could lead me on how to solve the issue, just a lot of bugs related to the RHP repository. I was lucky enough to get on a call with a good friend (@_rickgonzalez ) who is the PM of the RHP and we were able to work through it. So below is what I was able to do to solve the issue. Also it was confirmed by them , that this is a bug in the upgrade process of 18.X, so hopefully they will be fixing it soon. I concur and conclude, the process for GI 18c Upgrade is overly complicated, convoluted, contradicting, and not clearly documented, all having to do with MGMTDB and Rapid Home Provisioning (RHP) repository. Unless you’re lucky or know someone, good luck with your upgrade. Lastly, it would be greatly appreciated if you would share your upgrade experiences and/or results. Did you use GUI or silent? It's unique, it's awesome, it's part of Oracle Linux premier subscription and it's included in Oracle Cloud instances at no extra cost for all customers using Oracle Linux. After lots of hair pulling, bouts of frustration, I was able to grasp this nested list and dictionary thingie in JSON output of AWS cli commands such as describe-db-instances and others. If you run the describe-db-instances for rds or describe-instances for ec2, you get a huge pile of JSON mumbo-jumpo with all those curly and square brackets studded with colons and commas. The output is heavily nested. you get all the information but heavily nested within. Now if you only want to extract or iterate through, say VPCSecurityGroupId of all database instances, then you have to traverse all that nested information which comprises of dictionary consisting of keys which have values as arrays and those arrays have more dictionaries and so on. The variable mydb is a dictionary with key DBInstances. This key DBInstances has an array as its value. 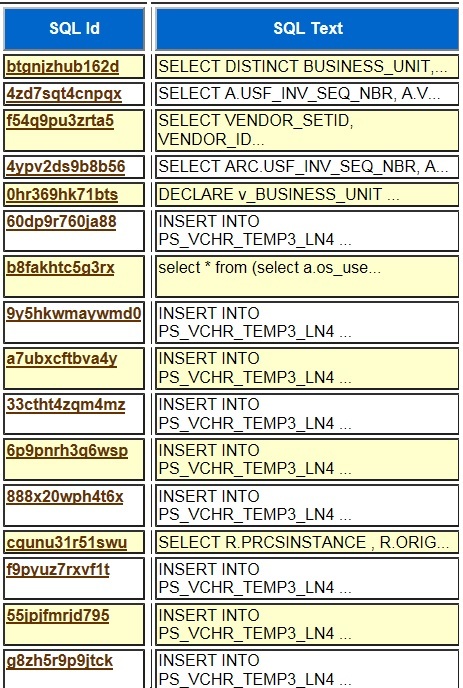 Now the first item of that array is another dictionary and the first key of that dictionary is VpcSecurityGroups. Now the value this key VpcSecurityGroups another array. This another array's first item is again a dictionary. This last dictionary has a key VpcSecurityGroupId and we want value of this key. If your head has stopped spinning, then read on and stop cursing me as I am going to demystify it now. "List info about one database"
I hope that helps. If you know any easier way, please do favor and let us know in comments. Thanks. The term serverless has been one of the biggest mindset changes since the term cloud, and learning how to “think serverless” should be part of every developers cloud-native journey. This is why one of Oracle’s 10 Predictions for Developers in 2019 is “The Economics of Serverless Drives Innovation on Multiple Fronts”. Let’s unpack what we mean by economics and innovation while covering a few common misconceptions. I often hear “cost reduction” as a key driver of serverless architectures. Everyone wants to save money and be a hero for their organization. Why pay for a full time server when you can pay per function millisecond? The ultimate panacea of utility computing — pay for exactly what you need and no more. This is only part of the story. Economics is a broad term for the production, distribution, and consumption of things. Serverless is about producing software. And software is about using computers as leverage to produce non-linear value. Facebook (really MySpace) leveraged software to change the way the world connected. Uber leveraged software to transform the transportation industry. Netflix leveraged software to change the way the world consumed movies. Software is transforming every major company in every major industry, and for most, is now at the heart of how they deliver value to end users. So why the fuss about serverless? Pundits point out that “focus on business value” has been said many times over the years, and they’re right. But every software architecture cycle learns from past cycles and incorporates new ways to achieve this goal of greater focus, which is why serverless is such an important cycle to watch. It effectively incorporates the promise (and best) of cloud with the promise (and learnings) of SOA . Ultimately the winning businesses reduce overhead while increasing value to their customers by empowering their developers. That’s why the economics are too compelling to ignore. Not because your CRON job server goes from $30 to $0.30/month (although a nice use case), but because creating a culture of innovation and focus on driving business value is a formula for success. So we can’t ignore the economics. Let’s move to the innovations. The web is fundamentally changing how we deliver services. We’re moving towards an “everything-as-a-service” world where important bits of functionality can be consumed by simply calling an API. Programming is changing, and this is driven largely by the depth of available services to solve problems that once plagued developers working hours. Twilio now removes the need for SMS, voice, and now email (acquired Sendgrid) code and infrastructure. Google’s Cloud Vision API removes the need for complex object and facial detection code and infrastructure. AWS’s Ground Station removes the need for satellite communications code and infrastructure (finally? ), and Oracle’s Autonomous Database replaces your existing Oracle Database code and infrastructure. Pizzas, weather, maps, automobile data, cats – you have an endless list of things accessible across simple API calls. As always, serverless innovation is happening in the world of open source as well, many of which end up as part of the list of services above. The Fn Project is fully open source code my team is working on which will allow anyone to run their own serverless infrastructure on any cloud, starting with Functions-as-a-service and moving towards things like workflow as well. Come say hi in our Slack. But you can get to serverless faster with the managed Fn service, Oracle Functions. And there are other great industry efforts as well including Knative by Google, OpenFaas by Alex Ellis, and OpenWhisk by IBM. All of these projects focus mostly on the compute aspect of a serverless architecture. There are many projects that aim to make other areas easier such as storage, networking, security, etc, and all will eventually have their own managed service counterparts to complete the picture. The options are a bit bewildering, which is where standards can help. With a paradox of choice emerging in serverless, standards aim to ease the pain in providing common interfaces across projects, vendors, and services. The most active forum driving these standards is the Serverless Working Group, a subgroup of the Cloud Native Compute Foundation. Like cats and dogs living together, representatives from almost every major vendor and many notable startups and end users have been discussing how to “harmonize” the quickly-moving serverless space. CloudEvents has been the first major output from the group, and it’s a great one to watch. Join the group during the weekly meetings, or face-to-face at any of the upcoming KubeCon’s. Expect workflow, function signatures, and other important aspects of serverless to come next. My hope is that the group can move quickly enough to keep up with the quickly-moving space and have a material impact on the future of serverless architectures, further increasing the focus on business value for developers at companies of all sizes. We’re all guilty of skipping to the end in long posts. So here’s the net net: serverless is the next cycle of software architecture, its roots and learnings coming from best-of SOA and cloud. Its aim is to change the way in which software is produced by allowing developers to focus on business value, which in turn drives non-linear business value. The industry is moving quickly with innovation happening through the proliferation of services, open source, and ultimately standards to help harmonize this all together. Like anything, the best way to get started is to just start. Pick your favorite cloud, and start using functions. You can either install Fn manually or sign up for early access to Oracle Functions. If you don’t have an Oracle Cloud account, take a free trial today. After getting the ovmcli run, here some commands which are quite helpful, when you are working with Oracle VM server. Very helpful is the Oracle documentation (here). Over the past year, the Micronaut framework has become extremely popular. And for good reason, too. It's a pretty revolutionary framework for the JVM world that uses compile time dependency injection and AOP that does not use any reflection. That means huge gains for your startup and runtime performance and memory consumption. But it's not enough to just be performant, a framework has to be easy to use and well documented. The good news is, Micronaut is both of these. And it's fun to use and works great with Groovy, Kotlin and GraalVM. In addition, the people behind Micronaut understand the direction that the industry is heading and have built the framework with that direction in mind. This means that things like Serverless and Cloud deployments are easy and there are features that provide direct support for them. Configure the application to use GORM connected to an ATP database. First things first, make sure you have an Oracle ATP instance up and running. Luckily, that's really easy to do and this post by my boss Gerald Venzl will show you how to set up an ATP instance in less than 5 minutes. Once you have a running instance, grab a copy of your Client Credentials "Wallet" and unzip it somewhere on your local system. You're now ready to move on to the next step, creating the Micronaut application. Take a look inside that directory to see what the CLI has generated for you. We aren't returning any content, but we can see the '200 OK' which means the application received the request and returned the appropriate response. Let's move to the next step and get the application ready to talk to ATP! Now let's modify the file located at `src/main/resources/application.yml` to configure the datasource and Hibernate. Our app is now ready to talk to ATP via GORM, so it's time to create a service, model and some controller methods! We'll start with the model. Take note of a few items here. We've annotated the class with @Entity (`grails.gorm.annotation.Entity`) so GORM knows that this is an entity it needs to manage. Our model has 3 properties: firstName, lastName and isCool. If you look back at the DDL we used to create the `person` table above you'll notice that we have two additional columns that aren't addressed in the model: ID and version. The ID column is implicit with a GORM entity and the version column is auto-managed by GORM to handle optimistic locking on entities. You'll also notice a few annotations on the properties which are used for data validation as we'll see later on. Let's move on to creating a service. That's literally all it takes. This service is now ready to handle operations from our controller. GORM is smart enough to take the method signatures that we've provided here and implement the methods. The nice thing about using an abstract class approach (as opposed to using the interface approach) is that we can manually implement the methods ourselves if we have additional business logic that requires us to do so. There's no need to restart the application here, as we've made no changes that would be visible at this point. We're going to need to modify our controller for that, so let's create one! The first step in our controller should be a method to save a `Person`. Let's add a method annotated with `@Post` to handle this and within the method we'll call the `PersonService.save()` method. If things go well, we'll return the newly created `Person`, if not we'll return a list of validation errors. Note that Micronaut will bind the body of the HTTP request to the `person` argument of the controller method meaning that inside the method we'll have a fully populated `Person` bean to work with. Since our model (very strangely) indicated that the `Person` firstName must be between 5 and 50 characters we receive a 422 Unprocessable Entity response that contains an array of validation errors back with this response. Now we'll add a `/list` endpoint that users can hit to list all of the Person objects stored in the ATP instance. We'll set it up with two optional parameters that can be used for pagination. We've seen here that Micronaut is a simple but powerful way to create performant Microservice applications and that data persistence via Hibernate/GORM is easy to accomplish when using an Oracle ATP backend. Your feedback is very important to me so please feel free to comment below or interact with me on Twitter (@recursivecodes). If you'd like to take a look at this entire application you can view it or clone via Github. May 7: JET another presentation, why oh why? May 7: APEX hui! Agil hui! Es gibt trotzdem Probleme zu überwinden! May 8: Know your Browser Dev Tools! As pointed out in the last post, the Cube Viewer is a new way of displaying data for advanced analysis. The Cube Viewer functionality extends the existing ConfigTools (a.k.a Task Optimization) objects to allow the analysis to be defined as a Cube Type and Cube View. Those definitions are used by the widget to display correctly and define what level of interactivity the user can enjoy. Note: Cube Viewer is available in Oracle Utilities Application Framework V4.3.0.6.0 and above. Design Your Cube. Decide the data and related information to to be used in the Cube Viewer for analysis. This is not just a typical list of values but a design of dimensions, filters and values. This is an important step as it helps determine whether the Cube Viewer is appropriate for the data to be analyzed. Design Cube SQL. Translating the design into a Cube based SQL. This SQL statement is formatted specifically for use in a cube. Setup Query Zone. The SQL statement designed in the last step needs to be defined in a ConfigTools Query Zone for use in the Cube Type later in the process. This also allows for the configuration of additional information not contained in the SQL to be added to the Cube. Setup Business Service. The Cube Viewer requires a Business Service based upon the standard FWLZDEXP application service. This is also used by the Cube Type later process. Setup Cube Type. Define a Cube Type object defining the Query Zone, Business Service and other settings to be used by the Cube Viewer at runtime. This brings all the configuration together into a new ConfigTools object. Setup Cube View. Define an instance of the Cube Type with the relevant predefined settings for use in the user interface as a Cube View object. Appropriate users can use this as the initial view into the cube and use it as a basis for any Saved Views they want to implement. Over the next few weeks, a number of articles will be available to outline each of these steps to help you understand the feature and be on your way to building your own cubes. In january 2019 Oracle released the documentation for Oracle Database 19c. Will 19c on premises software be released before may? Or later in summer? Monday, I used the coe_xfr_sql_profile.sql script from Oracle Support’s SQLT scripts to resolve a performance issue. I had to set the parameter force_match to TRUE so that the SQL Profile I created would apply to all SQL statements with the same FORCE_MATCHING_SIGNATURE value. I just finished going off the on-call rotation at 8 am Monday and around 4 pm on Monday a coworker came up to me with a performance problem. A PeopleSoft Financials job was running longer than it normally did. Since it had run for several hours, I got an AWR report of the last hour and looked at the SQL ordered by Elapsed Time section and found a number of similar INSERT statements with different SQL_IDs. Notice that in the bad plan the Rows column has 1 in it on many of the lines, but in the good plan it has larger numbers. Something about the statistics and the values in the where clause caused the optimizer to build the bad plan as if no rows would be accessed from these tables even though many rows would be accessed. So, it made a plan based on wrong information. But I had no time to dig further. I did ask my coworker if anything had changed about this job and nothing had. So, I created a SQL Profile script by going to the utl subdirectory under sqlt where it was installed on the database server. I generated the script by running coe_xfr_sql_profile gwv75p0fyf9ys 1314604389. I edited the created script by the name coe_xfr_sql_profile_gwv75p0fyf9ys_1314604389.sql and changed the setting force_match=>FALSE to force_match=>TRUE and ran the script. The long running job finished shortly thereafter, and no new incidents have occurred in future runs. The only thing that confuses me is that when I run fmsstat2.sql now with ss.FORCE_MATCHING_SIGNATURE = 5442820596869317879 I do not see any runs with the good plan. Maybe future runs of the job have a different FORCE_MATCHING_SIGNATURE and the SQL Profile only helped the one job. If that is true, the future runs may have had the correct statistics and run the good plan on their own. I wanted to post this to give an example of using force_match=>TRUE with coe_xfr_sql_profile. I had an earlier post about this subject, but I thought another example could not hurt. I also wanted to show how I use fmsstat2.sql to find multiple SQL statements by their FORCE_MATCHING_SIGNATURE value. I realize that SQL Profiles are a kind of band aid rather than a solution to the real problem. But I got out of the door by 5 pm on Monday and did not get woken up in the middle of the night so sometimes a quick fix is what you need. Developers have significantly greater choice today than even just a few years ago, when considering where to build, test and host their services and applications, deciding which clouds to move existing on-premises workloads to, and which of the multitude of open source projects to leverage. So why, in this new era of empowered developers and expanding choice, have so many organizations pursued a single cloud strategy? The proliferation of new, cloud native open source projects and cloud service providers over recent years who have added capacity, functionality, tools, resources and services, has resulted in better performance, different cost models, and more choice for developers and DevOps engineers, while increasing competition among providers. This is leading into a new era of cloud choice, where the new norm will be dominated by a multi-cloud and hybrid cloud model. As new cloud native design and development technologies like Kubernetes, serverless computing, and the maturing discipline of microservices emerge, they help accelerate, simplify, and expand deployment and development options. Users have the ability to leverage new technologies with their existing designs and deployments, and the flexibility they afford expands users’ option to run on many different platforms. Given this rapidly changing cloud landscape, it is not surprising that hybrid cloud and multi cloud strategies are being adopted by an increasing number of companies today. For a deeper dive into Prediction #7 of the 10 Predictions for Developers in 2019 offered by Siddhartha Agarwal, “Developers Decide One Cloud Isn’t Enough”, we look at the growing trend for companies and developers to choose more than one cloud provider. We’ll examine a few of the factors they consider, the needs determined by a company’s place in the development cycle, business objectives, and level of risk tolerance, and predict how certain choices will trend in 2019 and beyond. We are in a heterogeneous IT world today. A plethora of choice and use cases, coupled with widely varying technical and business needs and approaches to solving them, give rise to different solutions. No two are exactly the same, but development projects today typically fall within the following scenarios. A. Born in the cloud development – these suffer little to no constraint imposed by existing applications; it is highly efficient and cost-effective to begin design in the cloud. They are naturally leveraging containers and new open source development tools like serverless (https://fnproject.io/) or service mesh platforms (e.g., Istio) A decade ago, startup costs based on datacenter needs alone were a serious barrier to entry for budding tech companies – cloud computing has completely changed this. B. On premises development moving to cloud – enterprises in this category have many more factors to consider. Java teams for example are rapidly adopting frameworks like Helidon and GraalVM to help them move to a microservice architecture and migrate applications to the cloud. But will greenfield development projects start only in cloud? Do they migrate legacy workloads to cloud? How do they balance existing investments with new opportunities? And what about the interface between on-premises and cloud? C. Remaining mostly on premises but moving some services to cloud – options are expanding for those in this category. A hybrid cloud approach has been expanding, and we predict will continue to expand, over the course of at least the next few years. The cloud native stacks available on premises now mirror the cloud native stacks in the cloud thus enabling a new generation of hybrid cloud use cases. An integrated and supported cloud native framework that spans on premises and cloud options delivers choice once again. And, security, privacy and latency concerns will dictate some of their unique development project needs. IT investments are real. Inertia can be hard to overcome. Let’s look at the main reasons for not distributing workloads across multiple clouds. Economy of scale tops the list, as most cloud providers will offer discounts for customers who go all in; larger workloads on one cloud provide negotiating leverage. Development staff familiarity with one chosen platform makes it easier to bring on and train new developers; ramp time to productivity increases. Custom features or functionality unique to the main cloud provider may need to be removed or redesigned in moving to another platform. Even on supposedly open platforms, developers must be aware of the not-so-obvious features impacting portability. Geographical location of datacenters for privacy and/or latency concerns in less well-served areas of the world may also inhibit choice, or force uncomfortable trade-offs. Risk mitigation is another significant factor, as enterprises seek to balance conflicting business needs with associated risks. Lean development teams often need to choose between taking on new development work vs modernizing legacy applications, when resources are scarce. These are valid concerns, but as dev teams look more deeply into the robust services and offerings emerging today, the trend is to diversify. The most frequently cited concern is that of vendor lock-in. This counter-argument to that of economy of scale says that the more difficult it is to move your workloads off of one provider, the less motivated that vendor is to help reduce your cost of operations. For SMBs (small to mid-sized businesses) without a ton of leverage in comparison to large enterprises, this can be significant. Ensuring portability of workloads is important. A comprehensive cloud native infrastructure is imperative here – one that includes container orchestration but also streaming, CI/CD, and observability and analysis (e.g, Prometheus and Grafana). Containers and Kubernetes deliver portability, provided your cloud vendor uses unmodified open source code. In this model, a developer can develop their web application on their laptop, push it into a CI/CD system on one cloud, and leverage another cloud for managed Kubernetes to run their container-based app. However, the minute you start using specific APIs from the underlying platform, moving to another platform is much more difficult. AWS Lambda is one of many examples. Mergers, acquisitions, changing business plans or practices, or other unforeseen events may impact a business at a time when they are not equipped to deal with it. Having greater flexibility to move with changing circumstances, and not being rushed into decisions, is also important. Consider for example, the merger of an organization that uses an on-premises PaaS, such as OpenShift, merging with another organization that has leveraged the public cloud across IaaS, PaaS and SaaS. It’s important to choose interoperable technologies to anticipate these scenarios. Availability is another reason cited by customers. A thoughtfully designed multi-cloud architecture not only offers potential negotiating power as mentioned above, but also allows for failover in case of outages, DDoS attacks, local catastrophes, and the like. Larger cloud providers with massive resources and proliferation of datacenters and multiple availability domains offer a clear advantage here, but it also behooves the consumer to distribute risk across not only datacenters, but over several providers. Another important set of factors is related to cost and ROI. Running the same workload on multiple cloud providers to compare cost and performance can help achieve business goals, and also help inform design practices. Adopting open source technologies enables businesses to choose where to run their applications based on the criteria they deem most important, be they technical, cost, business, compliance, or regulatory concerns. Moving to open source thus opens up the possibility to run applications on any cloud. That is, any CNCF-certified Kubernetes managed cloud service can safely run Kubernetes – so enterprises can take advantage of this key benefit to drive a multi-cloud strategy. The trend in 2019 is moving strongly in the direction of design practices that support all aspects of a business’s goals, with the best offers, pricing and practices from multiple providers. This direction makes enterprises more competitive – maximally productive, cost-effective, secure, available, and flexible regarding platform choice. Though having a multi-cloud strategy seems to be the growing trend, it does come with some inherent challenges. To address issues like interoperability among multiple providers and establishing depth of expertise with a single cloud provider, we’re seeing an increased use of different technologies that help to abstract away some of the infrastructure interoperability hiccups. This is particularly important to developers, who seek the best available technologies that fit their specific needs. Serverless computing seeks to reduce the awareness of any notion of infrastructure. Consider it similar to water or electricity utilities – once you have attached your own minimal home infrastructure to the endpoint offered by the utility, you simply turn on the tap or light switch, and pay for what you consume. The service scales automatically – for all intents and purposes, you may consume as much output of the utility or service as desired, and the bill goes up and down accordingly. When you are not consuming the service, there is no (or almost no) overhead. Development teams are picking cloud vendors based on capabilities they need. This is especially true in SaaS. SaaS is a cloud-based software delivery model with payment based on usage, rather than license or support-based pricing. The SaaS provider develops, maintains and updates the software, along with the hardware, middleware, application software, and security. SaaS customers can more easily predict total cost of ownership with greater accuracy. The more modern, complete SaaS solutions also allow for greater ease of configuration and personalization, and offer embedded analytics, data portability, cloud security, support for emerging technologies, and connected, end-to-end business processes. Serverless computing not only provides simplicity through abstraction of infrastructure, its design patterns also promote the use of third-party managed services whenever possible. This provides flexibility and allows you to choose the best solution for your problem from the growing suite of products and services available in the cloud, from software-defined networking and API gateways, to databases and managed streaming services. In this design paradigm, everything within an application that is not purely business logic can be efficiently outsourced. More and more companies are finding it increasingly easy to connect elements together with Serverless functionality for the desired business logic and design goals. Serverless deployments talking to multiple endpoints can run almost anywhere; serverless becomes the “glue” that is used to make use of the best services available, from any provider. Serverless deployments can be run anywhere, even on multiple cloud platforms. Hence flexibility of choice expands even further, making it arguably the best design option for those desiring portability and openness. extract/export data without incurring significant expense or overhead? be deployed either on-premises or in the public cloud, including for custom applications, integrations between applications, etc.? monitor and manage applications that might reside on-premises or in other clouds from a single console, with the ability to aggregate monitoring/management data? And does it have a good set of APIs that enables access to everything in the UI via an API? Does it expose all the business logic and data required by the application? Does it have SSO capability across applications? The CNCF (Cloud Native Computing Foundation) has over 400 cloud provider, user, and supporter members, and its working groups and cloud events specification engage these and thousands more in the ongoing mission to make cloud native computing ubiquitous, and allow engineers to make high-impact changes frequently and predictably with minimal toil. We predict this trend will continue well beyond 2019 as CNCF drives adoption of this paradigm by fostering and sustaining an ecosystem of open source, vendor-neutral projects, and democratizing state-of-the-art patterns to make these innovations accessible for everyone. Oracle is a platinum member of CNCF, along with 17 other major cloud providers. We are serious about our commitment to open source, open development practices, and sharing our expertise via technical tutorials, talks at meetups and conferences, and helping businesses succeed. Learn more and engage with us at cloudnative.oracle.com, and we’d love to hear if you agree with the predictions expressed in this post. Farmatodo, a leading Venezuelan self-service chain of pharmacies, has specialized in providing medicine, personal care, beauty and baby products to help consumers care for themselves and their families for more than 100 years. Through a seamless shopping experience, the company offers approximately 8000 products in more than 200 stores and online in Venezuela and Colombia. With Oracle Retail, Farmatodo has established a framework to expand into new countries, deploy new stores faster, and gained the agility to serve in-store shoppers better with a modern point of service (POS) system. In addition, this new technology will support Farmatodo’s aggressive delivery model in Colombia. While the area is known to have challenging traffic congestion, the pharmacy offers home delivery in up to 30 minutes. To help fulfill this promise, having the real-time inventory visibility and store consistency Oracle provides is critical. The company relies on Oracle Retail Merchandising System, Oracle Retail Store Inventory Management and Oracle Retail Warehouse Management System to manage the business at a corporate level and Oracle Retail Xstore Point-of-Service to enhance the consumer experience on the store floors. Farmatodo selected Oracle PartnerNetwork (OPN) Platinum level member, Retail Consult to implement the latest versions of the solutions. A longtime collaborator, Retail Consult has a deep understanding of Oracle technology, retail process, and customers. The company employed a multifunctional team with a strong customer-centric approach, along with the Oracle Retail Reference Model, to chart a path to success for Farmatodo. “For thirty-plus years, we have been working hand-in-hand with global retailers to help ensure successful implementations and outcomes. The power of this combined knowledge continues to be central in delivering unmatched industry best practices and guiding innovations that are enabled by our modern platform. Our goal is to help our customers keep pace with the changes in consumer behavior and to enable them with operational agility and a clear view into their operations so they can move at the same speed,” said Mike Webster, senior vice president, and general manager, Oracle Retail. Retail Consult is a highly specialized group that has a big focus on technology solutions for retail, offering clients global perspective and experience with operations in Europe, North, South and Central America. The most senior resources average 15 years of retail experience, and the multilingual team integrates retail-specific skills in strategy, technology architecture, business process, change management, support, and management. Oracle is the modern platform for retail. Oracle provides retailers with a complete, open, and integrated platform for best-of-breed business applications, cloud services, and hardware that are engineered to work together. Leading fashion, grocery, and specialty retailers use Oracle solutions to accelerate from best practice to next practice, drive operational agility and refine the customer experience. For more information, visit our website www.oracle.com/retail. Westchester Community College is implementing Oracle Student Cloud solutions to support its goal of providing accessible, high-quality and affordable education to its diverse community. The two-year public college is affiliated with the State University of New York, the nation’s largest comprehensive public university system. To keep pace with fast-changing workforce requirements and student expectations, institutions such as Westchester Community College are evolving to improve student outcomes and operational efficiency. This change demands both a new model for teaching, learning and research, as well as better ways to recruit, engage and manage students throughout their lifelong learning experience. Oracle Student Cloud solutions, including Student Management and Recruiting, will integrate seamlessly with Westchester’s existing Oracle Campus student information system. With Oracle Student Management, the school will be able to better inform existing and prospective students about classes and services, and Oracle Student Recruiting will improve and simplify the student recruitment process. The college will also be using Oracle Student Engagement to better communicate with and engage current and prospective students. Supporting the entire student life cycle, Oracle Student Cloud is a complete suite of higher education cloud solutions, including Student Management, Student Recruiting, Student Engagement, and Student Financial Planning. As a set of modules, designed to work as a suite, institutions are able to choose their own incremental path to the cloud.